Last month Chinese manufacturer Ainol launched a 7” tablet based on the Chinese microprocessor JZ4770 developed by Ingenic in Beijing. The processor is a single core processor running at 1GHz, fabbed in 65nm plain vanilla CMOS process and executing the MIPS instruction set. We have now managed to secure a unit and we are suitably impressed. 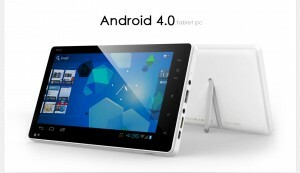 For the $89 + shipping you get a 7” tablet running Android 4.0.3. It contains 512MB DRAM as well as 8GB NAND flash, but the flash memory can be expanded by a further 32GB using a microSCHD card. The graphics engine is capable of displaying 1080p using the HDMI-port on the side. The display itself has a resolution of 480 x 800 pixels. We have played several different movies in 1080p without a single hitch and the tablet runs about 7 hours, which is quite impressive. It is obvious that for $89 you do not get the equivalent of an iPad, but you get a very useful product that is running the latest version of Android. We see no reason why you should not be able to upgrade the firmware at a later date, when it becomes available. We have also tried several applications from the Marketplace and found the Kindle Reader especially useful as it will allow the Ainol NOVO7 Basic to do double duty. Right now it is our favorite way of reading newspapers and it is a lot cheaper than the Kindle Fire.